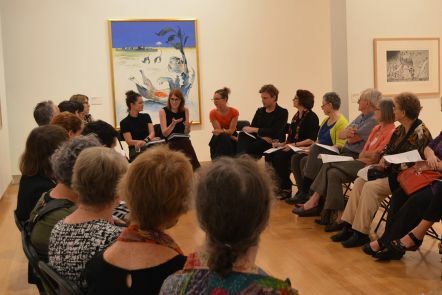 QUT Art Museum facilitates programs such as TEXTA book club, which runs alongside current exhibitions and uses literature to explore the themes and emotions of art. QUT Art Museum is the custodian of the QUT art collection. The collection contains more than 2,000 objects, including paintings, sculptures, decorative arts and works on paper, mostly by Australian artists. The collection has a history of strong and adventurous commitment to contemporary art, and the majority of works date from the 1960s onwards. QUT Art Museum is open to the public Tuesday to Sunday. The museum is closed on Mondays, public holidays and during exhibition installation periods. Check the opening hours before you visit. QUT Art Museum is located at our Gardens Point campus, next to the City Botanic Gardens and walking distance from the centre of Brisbane and South Bank. There is a range of food and retail outlets at Gardens Point. The campus is also a short walk from extensive dining and shopping options in Brisbane's CBD and across the river at South Bank. During your visit to our Gardens Point campus, you'll also be able to enjoy a number of other cultural venues on campus. Drop in to the historical house museum and the William Robinson Gallery at Old Government House, or just relax on the lawns and verandas outside. Grab tickets to one of the professional or student productions at Gardens Theatre. Visit the Cube at our Science and Engineering Centre and play on one of the world's largest touch-screen systems.